DVI is now a channel marketing partner of iNovum, LLC, based in Saratoga Springs, NY, enabled to see the full suite of Mind Genomics® solutions described by Malcolm Gladwell as “the next generation of predictive analytics”. Developed by Dr. Howard R. Moskowitz, Mind Genomics is a quantitative, empirically based profiling methodology which cuts across traditional demographic, psychographic and behavioral segmentation by aligning directly with individual mind-sets. It can be applied to any B2C or B2B category to improve return on marketing investments. Mind Genomics is built on the science of Rule Developing Experimentation (RDE) created by Dr. Moskowitz in cooperation with Prof. Jerry (Yoram) Wind of the Wharton School of Business. It is based on the principle that perception drives behavior, purchase and consumption. It uses a variation of conjoint analysis as its statistical basis. About H. R. Moskowitz, Ph.D.
Dr. Moskowitz is Chairman of iNovum, LLC. He is an experimental psychologist and an inventor of world-class marketing research technology. Howard holds a Ph.D. from Harvard and lectures there and at Wharton. He’s won numerous awards, including the David R. Peryam Award and the Charles Coolidge Parlin Marketing Research Award for his substantial contributions and dedication to the advancement of marketing research practices. Most recently, Howard won a Bronze Edison Award based on work done in the emerging science of Mind Genomics and the technology of informatics. DVI co-sponsored FundingPost’s Angel / VC Summit on August 7. Joe Rubin, the event organization, did a fantastic job bringing us all together. Over 200 entrepreneurs and investors gathered at La Marina in New York where many seeking capital got to pitch their ideas to the Angels and VCs present. DVI has been helping tech start-ups and those who invest in them for about a year providing guidance on everything from leadership to the importance of flawless execution. We’ve helped launch new businesses, products and services for blue-chips like Aetna, Costco, DoubleClick/Google, General Motors, JP Morgan/Chase, IBM, Oracle, PepsiCo, P&G and others. We’ve provided digital/social advisory and leadership coaching to senior executives at Converseon, Expion, Lincoln Financial Media, Plyfe, Sanofi-Aventis and Sound-Elkin to name just a few. We’re now leveraging our experience to help startups within a budget and context relevant to them. 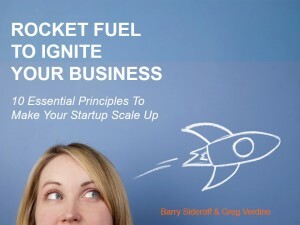 In response to this, Greg Verdino and I have released our new e-book, Rocket Fuel to Ignite Your Business: 10 Essential Principles to Make Your Startup Scale Up to rave reviews. While it is written primarily for entrepreneurs and the Angels and VCs who invest in them, it has equal relevance to established companies, large and small, who are in the process of transitioning to the new digital era.